If you’ve ever looked at Fairewinds Associates videos, you know that the big problem at Fukushima is the drying up of the cooling pools which are suspended over the reactor vessel and contain the spent (but extremely radioactive) fuel rods. Before a worst case accident occurs, I believe the spent fuel rods must ultimately be removed from the damaged cooling pools and stored off-site (that is, in a place that doesn’t happen to be over a nuclear reactor). But how do we get the rods out of the cooling pools? 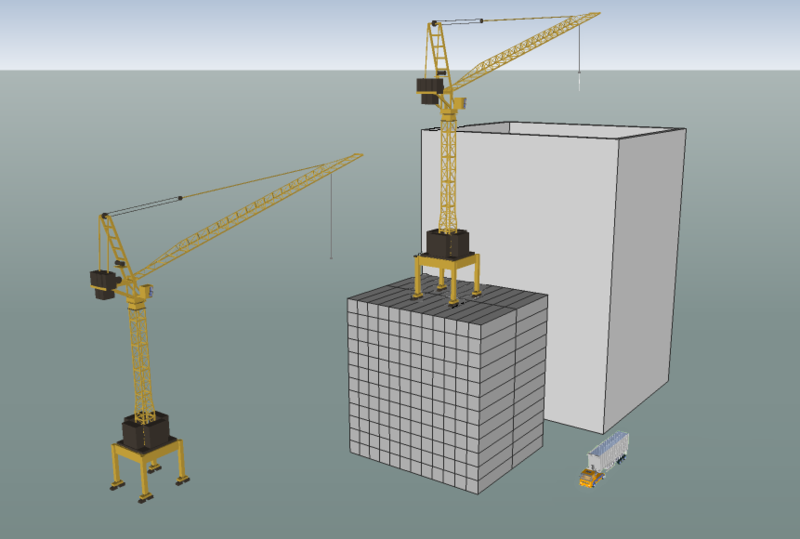 The tower crane that I found in Google Sketchup 3D Warehouse is only 60 meters tall, which is unfortunate because that’s about the height of the Fukushima reactor buildings (prior to having their roofs blown off) and therefore doesn’t allow any reach. The crane on the ground erects the platform, upon which is built the upper crane, which can access the fuel rods in the cooling pool and remove them. Shipping containers are normally stacked no more than seven or eight high, but since an intermodal shipping container can hold about five times its weight, I thought it was fair to assume that empty containers can be stacked up to five times higher than loaded ones. If so, then a stack of twelve as shown is not a problem. I’m not saying there aren’t better ideas. But I do think this is safer than concrete burial. This entry was posted in Uncategorized and tagged fuel rods, fukushima, shipping containers. Bookmark the permalink.